Ulster lock Alan O'Connor has been banned for three weeks after being found to have made a dangerous tackle in the Pro12 win over Glasgow. O'Connor was cited after an incident which left the visitors' Mark Bennett unconscious in last Saturday's match at Kingspan Stadium. 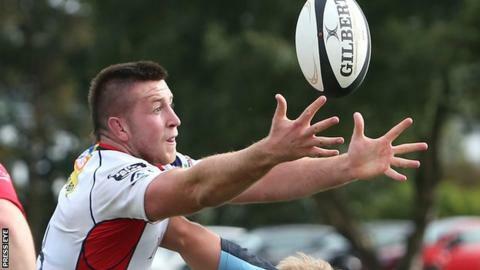 The Ulster lock was given the ban on Wednesday after attending a disciplinary hearing in Cardiff. On Tuesday, Ulster indicated they would contest any suspension. As it stands, O'Connor is set to miss this week's European Champions Cup opener against Leicester and next week's game against Toulon, followed by the Pro12 game against the Dragons. His likely absence will be a blow for Neil Doak's side, who are already without injured locks Iain Henderson and Dan Tuohy. O'Connor played two games for Ulster two seasons ago but injury prevented him from making his third appearance until this month against Edinburgh. Speaking after last weekend's match, Glasgow coach Gregor Townsend said that Bennett had lost consciousness after being "choke tackled" but that he had recovered. However, Ulster coach Doak said on Tuesday that the Irish province had been surprised by O'Connor's citing. "We don't see anything in it," added Doak. "It's part and parcel of the game. That lock-up type tackle happened quite a few times in the game." Wednesday's disciplinary hearing ruled that O'Connor's offence had been at the "mid-range" which would normally incur a six-week suspension. However, because of the absence of aggravating factors and O'Connor's previous exemplary record, the suspension was reduced to three weeks. The disciplinary committee was comprised of chairman Roger Morris [Wales] plus Rhian Williams [Wales] and Dr Barry O'Driscoll [Ireland].